Easilly in my top 10 most fun species to target. Which is why I'll gladly do it even though I'm in a state with hundreds of species I need to add to my life list. Noah and I basically fished a small stream in a jungle today. A small stream full of tilapia, sunfish, snook, giant bass, and a plethora of other species. I've added 7 species to my list thusfar on this trip. South Carolina, Georgian, and Florida all just blend together in the dark. A basically unbroken, straight as an arrow, deer threatening to jump in front of you, dark, tedious, unwinding stretch of Rt. 95 lead Noah and I closer to the real beginning of our adventure. Beautiful and fish filled though all of the states on our way to Florida are, they aren't where we were going. The adventure would start when the sun rose on Christmas day and we stepped out of the van into a cool Florida morning and looked out over a beautiful sight: mullet jumping, a dolphin hunting the shallows and the sun rising next to the massive NASA Vehicle Assembly Building. Since 2013, I have payed a visit to my home river every Christmas Eve Morning, regardless of water conditions. Above are some of the reasons why this has become a tradition. Out of the previous 5 years, two were outright skunkings and three were some of the most memorable fishing trips I've taken. 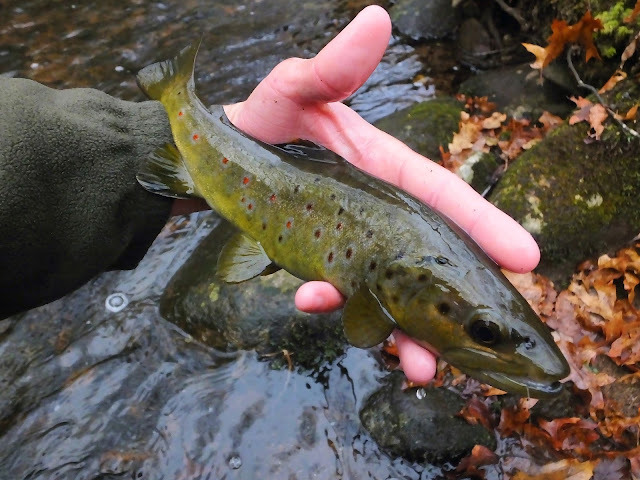 Had it not been for my capture of the giant brown named Grandfather on Dec. 24th, 2013 in some of the worst stream conditions I've ever fished this tradition would not have started at all. Dec. 24th, 2014 was a 30 fish day. 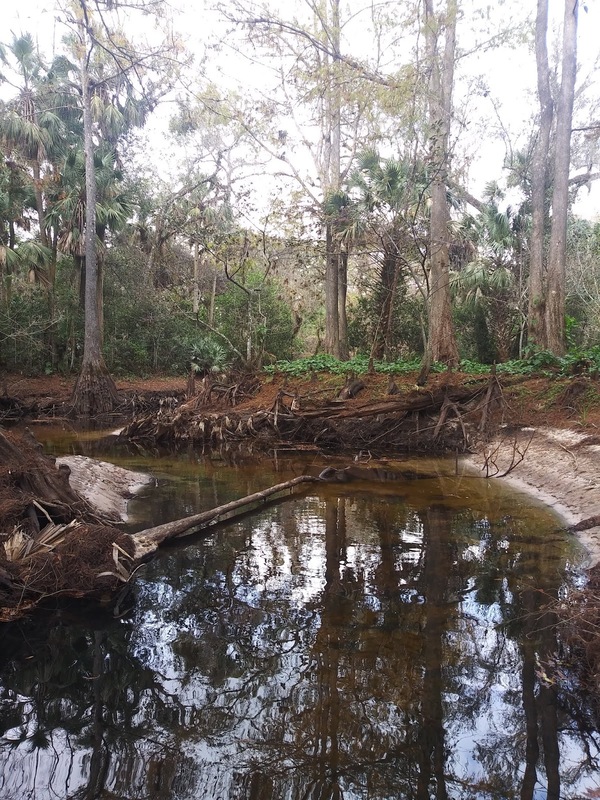 December 24th, 2015 was a skunking due to suspended leaf litter in the drift. December 24th, 2016 was a skunking due to ice. December 24th 2017 was the best day I'd had on my home river since 2014. This year, I knew beforehand that I'd be on the road all day on the 24th. Fishing my home river that day was not going to happen. So, I chose to go the day before. The conditions were not great, but I know this river better than the back of my own hand. Under higher flows like this, I know where the deep buckets are that the trout lie in and how to drop my nymph into them, and I know what water to skip over. I made out more than well enough, and I consider the tradition upheld. Happy holidays everyone. I hope this finds you all well and in good spirits. Yesterday was the day I needed. I fished with one of my favorite people on one of my favorite streams and caught some of my favorite fish species. It was beautiful out. The water was cold, but ice in the guides never occurred. It a pleasant winter day to be on the water. Alan Petrucci and I spent our morning fishing a watershed that has some of both of our biggest CT wild brook trout. It is special water for both of us, with a memory coming to mind in each spot. Sadly much of the lower part of the big stream is now almost unrecognizable, completely re-shaped by this year's high water. We caught nor saw no fish in that stretch, but above we found a handful of willing fish. I stuck with a Woolly Bugger the entire time and never changed. I was hoping to tempt some of the big residents with that fly, but I also knew the smaller brookies would have no problem eating that fly at all. The first fish I caught, out of a very deep bend, was a fallfish. Quite a good one for this small stream as well. The very next cast I caught on made from the same exact cookie cutter. They didn't fight with the same vigor that they do in warmer water, but it was a welcome surprise to catch those two. A little upstream from the bend where I caught the two fallfish, I worked my streamer through a nice riffle that I've caught a few brookies from before. My first fish of 2016, actually, was from this same riffle, on a Pinkie. This time the Bugger did the job, and the first brookie of the day came to hand. It was a perfect little fish. Though it was probably already well above freezing by that time I didn't want to risk it and left the fish in the water to take photos. Not long after that Alan worked through the very same water, and at the tail out elicited a strike from a fish that I hadn't found. Neither of us could get it to come back out though. Upstream further still, I got my last fish of the outing. She was a real beauty. Pale belly, nice pink-orange fins, and a good array of red spots. I have to wonder if she will grow to be one of the giants this stream produces. After that point we went downstream where we found that things had change a lot and the fish had gone elsewhere. I suspect the we would have found more fish had we stayed were we started out, but you won't know if you con't go and my confidence was in the water down below, at least before this year's raging floods scoured the place out. With how much rain we just got I don't think the stream will look the same when it drops as it did on Thursday. Things can change very quickly on these little rivers. I've had a tough week and a half. The fishing has been sub par, a few things have gone wrong in my personal life that I won't divulge, and I've just gotten sick of it all. There was one afternoon that I spent on the water with a quiet light snow falling that was just wonderful, despite only one tiny brookie taking my fly. But other than that I've found little comfort or satisfaction. I should have fished today, but I just couldn't get up the motivation to leave the house after the morning I had. It would seem that the opposite would be the case: that I'd solve life's stress simply by fishing. But it isn't that simple for me because I don't just fish to relax. I fish to learn, and today I just didn't feel like doing that learning out there. So I did a bit of work and then dove into wrasse identification studies, spurred on when a fellow multi-species angler, Roy Leyva, posted a photo of the prettiest puddingwife wrasse (Halichoeres radiatus) I've ever seen. I'll need to know these things because in a week I'll be in a place where catching new wrasse species is very probable. The study time was much needed but it failed to relax me. Since my last trip to Florida, I really have caught nothing here at home that excited me. No memorably colorful brook trout, no big browns, no fat largemouth through the ice... I feel like I've been dragging my feet, waiting for something special to happen. That's not who I am. I don't wait for something special to happen. I buckle down and make it happen. So... there are better days are to come. I know that because I will make them better. Tomorrow will be a much needed relief. And then early Christmas celebrations. Then Noah and I will go south to warmer weather and abundant, beautiful species both native and exotic invasive. It is going to be the best species hunting fishing trip of the year, likely of my life so far. I'm needing a trip like that in the worst way. I can't wait. Bluefish are not one of the "glamour fish" in the Northeast saltwater scene. But they probably should be, because catching really big ones on light tackle is a challenge, and unlike any other saltwater species we have readily available they jump... a lot. 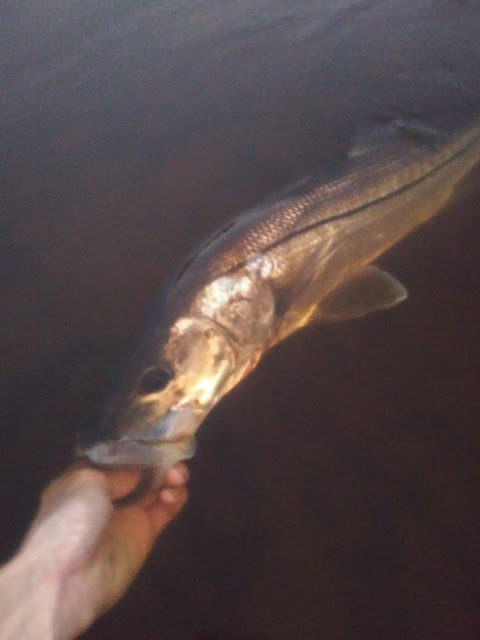 A 12 pound bluefish in shallow water jumps just like a tarpon, and on a 9wt fly rod a blue that size is going to put you into the backing without hesitation. And the hit that proceeds this battle exudes aggression and murderous intent. So for this Species Profile, it's nothing but love for ol' yellow eyes, Pomatomus saltatrix. Bluefish are an abundant pelagic fish, the only extant species of Pomatomidae. They have a white belly and gray-blue-green back, a forked tail, yellow eyes, and a mouth full of small but dangerous teeth. They are found in subtropical and temperate zones, excepting the North Pacific. Blues spawn offshore in the spring and summer where their fry are then at the mercy of the current, mere zooplankton, nothing remotely resembling the vicious predators they aren't that far from becoming. Currents carry the tiny fish nearshore, by which time they have gained more mobility. The juvenile bluefish then grown larger on the bounty provided by shallow estuarine waters. Once big enough, anything more than 7 inches, they start venturing out and hunting small baitfish in small packs or huge, marauding schools. Bluefish may live nearly 10 years and grow larger than 20 pounds, and they just don't loose that affinity for blitzing. With mouths full of razor sharp teeth they chop menhaden, squid, bay anchovies, and silversides into pieces then sucking them down as the sink. If I were a small baitfish, I think death by bluefish would be my worst nightmare. Blues are not the yearly staple in the Northeast many younger anglers would assume they are. There have been time periods when blues were legitimately uncommon in parts, and a bluefish caught was actually a surprise. It seems that things may currently be trending in that direction, as big bluefish have become far less abundant in the last few year, especially in the late summer and fall. Exactly why this ebb and flow of local bluefish numbers occurs is unknown. It may be something as simple as natural migration. Fly and gear selection for blitzing bluefish is generally simple. Bob's Banger, Clouser Minnow, Lefty's Deceiver, Surf Candy, Hollow Fleye, Sedotti Slammer: match the bait size and profile at least roughly and there will be no reason for the fish to refuse. 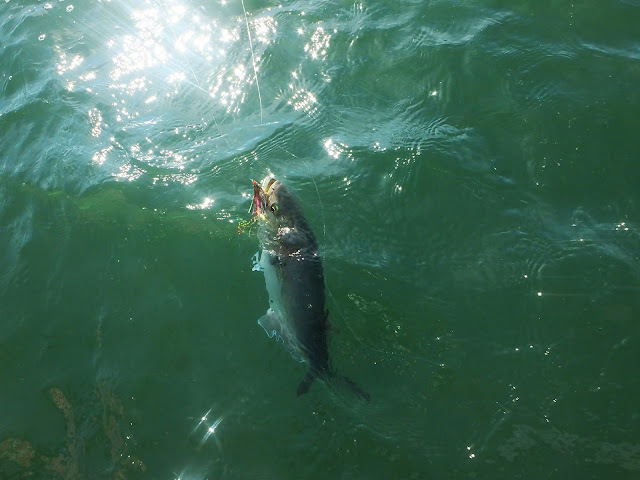 Forgetting to bring wire to target bluefish is playing with fire: these are toothy fish, you will get bit off, and it will be the biggest of the day. I, of course, am very reckless and often target big bluefish with no wire. I am also very lucky. So don't follow my example, follow my advice! Use wire! 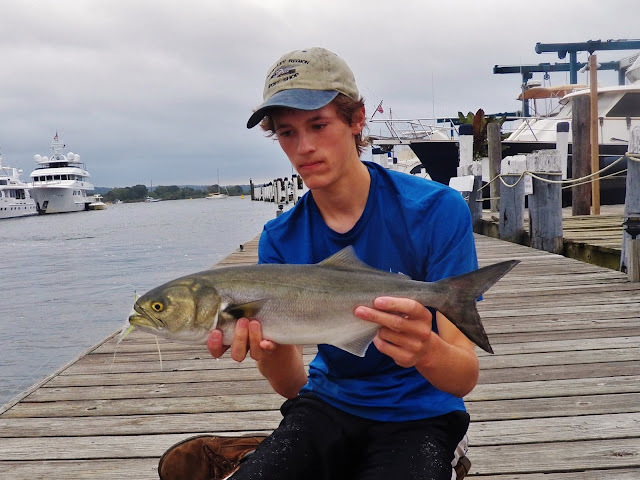 A good bluefish on Popovic's Beast Fleye, coaxed out from a mix of much smaller fish. For big blues on big flies, 9 and 10wt rods are preferable. For the more numerous 2-6lb fish a 7 or 8 will do fine. And for snapper blues a 4 or 5 will provide great fun. Big bluefish and big flies demand stout leaders, I use a 6ft 30lb leader down to my 16 inch wire bite tippet (if I'm using it). I use wire that I can tie as apposed to a clip-on style leader. I tie a loop knot to the fly and a loop to loop connection to the leader. A monster bluefish caught on 20lb tippet, no wire, with a popper. The fight lasted well over 20 minutes and the fish jumped numerous times and got well into the backing... twice. Because of their aggressive blitzing tendencies many would assume that catching blues is always easy. But it isn't. There are times when bluefish are finicky and picky. One such time is when they are layed up near the surface, digesting. This typically occurs in the morning and midday hours with slick calm waters throughout late spring and summer. Sunshine can enhance the situation too. Bluefish will finish up with a night's feeding, usually on menhaden, then find a good place to soak up the sun and digest that fatty meal. They may sit deep enough that they are only noticeable when spooked, or they may be finning right at the surface. Tailing blues will daisy chain just like tarpon, or gather in tightly packed schools of hundreds if not thousands, presenting themselves almost like adult menhaden do. The tips of big blues' tails barely poke through as they gently move along. This behavior occurs most often near river mouths in water less than 12 feet deep, though I've also seen it over reefs on the slack tide. Bluefish are a sight-based predator. Even though these finning blues are not feeding at all, they still have the prey image of what they were last feeding on. Because this is nearly always menhaden, something of equivalent shape and size is more likely to trigger a strike. Poppers may also draw great strikes. A floating line and unweighted or lightly weighted flies are necessary as these fish are right at the top of the water column. I've had problems with my line spooking tailing blues, so I ere on the longer side with my leaders now, 9-10ft. If you can't see the fish in the water to sight cast to but know they are around, fan cast. Cover as much water as you can. Bluefish may not be even close to as unpopular as the species I profiled in the last post in this series (flyfishingcts.blogspot.com), but they don't get the respect they deserve from a lot of anglers. They are tremendous sport, especially on fly tackle. I hope this inspires some of you to go out and target these wonderful fish. Thanks to Ian Devlin for teaching me most of what I know about tailing blues, and Mark Alpert and Patrick Barone for the assists on the two biggest blues I've ever caught. New England winters exist in near perfect contrast to New England summers. The abundance of life and color gives way to a very brief spell of even more color until almost everything goes to sleep. I sat "near perfect contrast" and "almost everything goes to sleep" because these things seem so to the untrained eye. In reality life and color carry on, maybe a little subdued, but when painted on a canvass of dull grey the what remains awake through the winter is remarkably bright. For those in the know, winter provides some of the best fly fishing to be had all year. 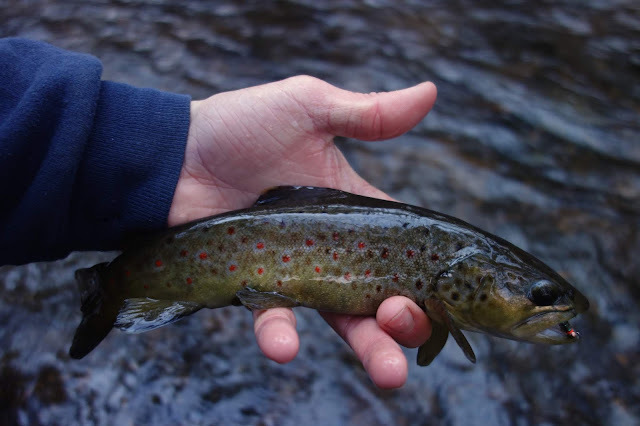 The macroinvertabrate abundance available from late March till December has diminished, brown and brook trout have spawned and are looking to regain the weight they lost. If you know where to look and how to fish, and know that you must put your time in, winter could easily result in the biggest trout of your life. Winter, to me, is my time to trout fish. Most others have thrown in the towel. The rivers are cold and icy and the fish are much slower than they were just a month ago. But I know, without a doubt, that if I put the time in on the right stream with the right methods, I will catch trout. One may be the biggest brookie of the year. One may be a huge holdover rainbow. . But the real endgame is always the same. 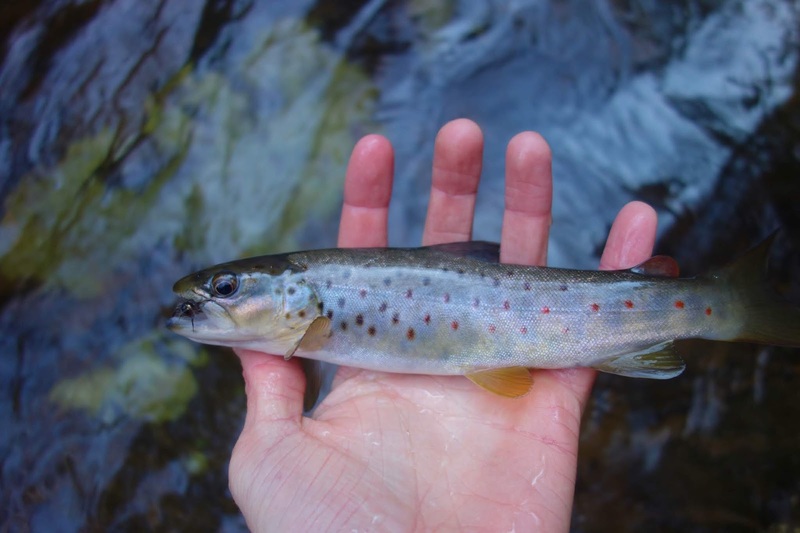 I'm looking for the biggest, baddest, oldest trout in every stream I fish. I am tasked with finding something so big and colorful that it should be hard to hide in the clear waters and grey and white background of winter. It is a challenge best left for those with a discerning eye, a quiet step, and an unending patience. I've been patiently watching the local bodies of water over the last seven days, looking to see if and when there'd be safe, fishable ice in the neighborhood. I started to thoroughly enjoy ice fishing last year, and this year I'm hoping to take it to another level and catch some big fish through the ice. I also intend to start selectively keeping perch, bluegills, and crappie. I don't do this much in the summer because most of my local fishing travel is done via bike, and I like to be out for hours. Not the best scenario for bringing fish home to eat. But with cold weather I can carry fish on my person much more readily. Basically, I've been very much looking forward to this ice season, which has never been the case any other year I'd ever fished. 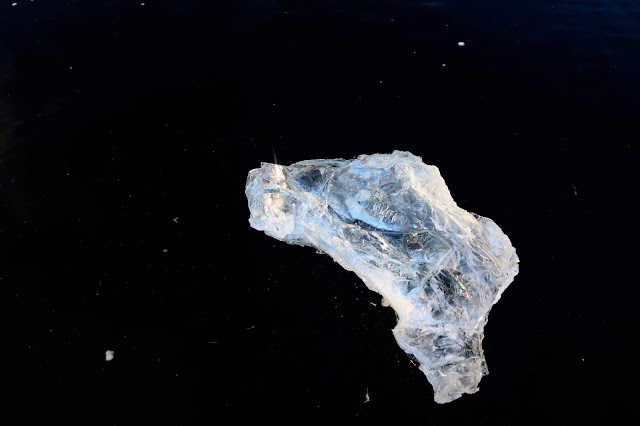 Today I found safe ice. It was beautiful, strong, clear ice well above my comfortability minimum 2 1/2". I am a tall and scrawny person, I weigh a lot less than average. For anybody else I wouldn't advocate anything less 3", as is the generally accepted safe thickness for a single person. What I didn't find were willing bass or bluegills. I also couldn't get to where I was sure they'd be because it was surrounded by sketchy ice where plants were through the surface. Always avoid these areas when the ice is new and less the 5 inches, the plants absorb heat and today it took one hit with the hatchet I was using to cut holes to break through that stuff... put both feet on that and you're going in even though right next to it is perfectly safe ice. This is why carrying a spud bar and knowing how to use it really is smart if you are a beginner like myself. You may be noticing the bulk of the text so far in this post has nothing to do with the title. Now is where I get to that. I wasn't sure I'd find safe ice, so I came prepared with a backup plan. Or at least I thought I came prepared. There are a fair number of brook trout streams in close proximity to the places I was checking, if I failed to find and catch any fish through the ice I could switch gears and go for brook trout. 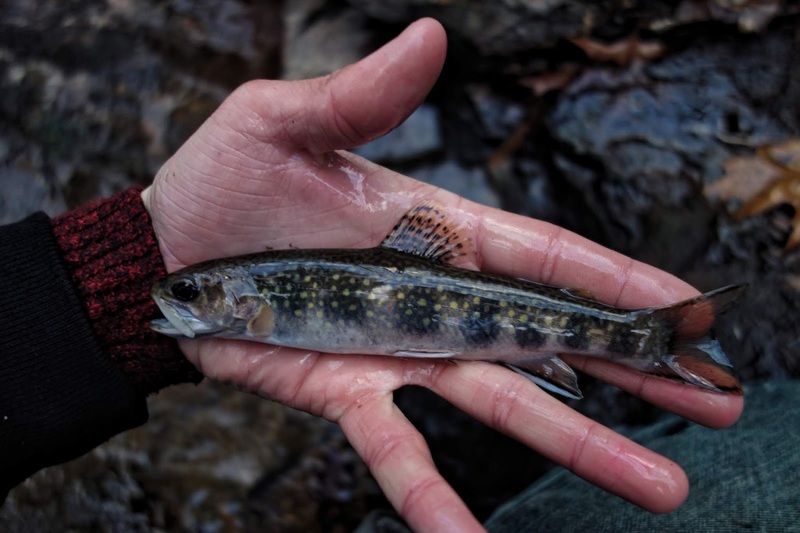 When it became clear I wasn't going to be getting my first fish of the season on the hard water I payed a visit to a particularly small brook trout stream on the way home. I hiked into the ravine and began rigging up only to find that I had left the reel at home. Without skipping a beat I pulled 7 feet of line off my spinning reel, tied it to the tip of my rod, stuck a jig style Green Weenie on the end, and went about fishing with very little concern as to how well it would work. You see, I've done this before intentionally to see how far I could "dumb down" my gear. I've used a trimmed maple sappling to fish a small stream before. I've also learned to cast a fly line without use of a rod, just carrying a reel in my pocket and using my arm to shoot the line into tight spots. I caught brook trout doing so. And did I catch fish today using a 7' 4lb mono leader clinched to the tip of my 3wt? The takeaway of this, as the title suggests, to keep things stupid simple. Complexity, in general, is more prone to fault, especially in small stream fishing. You certainly don't have to go to the extent of whittling down a sapling to use as a rod or learning to cast effectively without one. But you will probably have a better experience doing this type of angling if you keep your tackle simple. 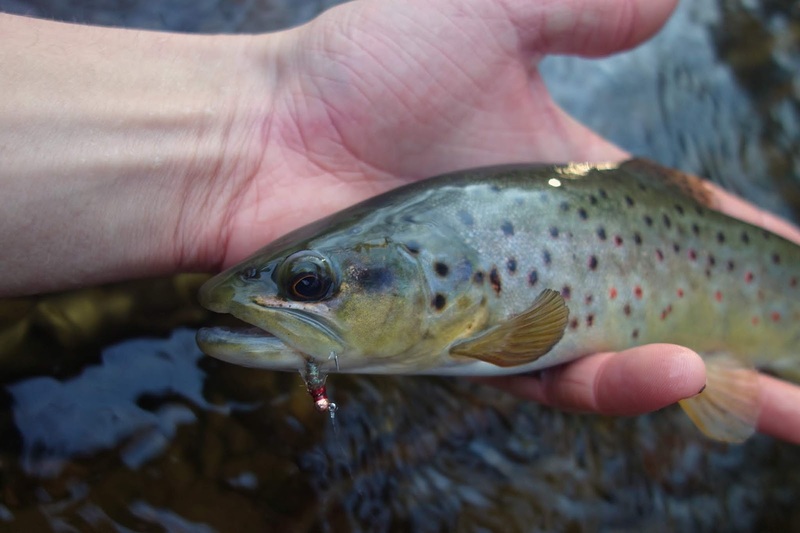 I regularly carry a small but not limiting selection of flies, a short, light rod, a small, uncomplicated reel, one leader on the spool, another in my bag, and one or two spools of tippet... that and whatever other non-fishing-specific necessities I must bring when fishing small water. I often don't bother with waders. I am less likely to loose things, less likely to break expensive equipment, and my bag is comfortably light so I can maneuver very easily. Keep things right at the edge of being stupidly simple. My constant pursuit of new fish species has been far more rewarding than I ever thought it would be when I started. There are too many fish species on this planet to catch in a lifetime, much less on a fly rod. The hunt is never really the same. Techniques, locations, gear... it may be close, even the same at surface value, from one species to another, but there is always something new to learn. Always. Sometimes I learn enough before catching a new species that I get it on the first try. Sometimes, as with my grass carp campaign, it takes a bunch of trips to same body of water to learn enough to succeed. And, sometimes, you drive more than 140 miles in a day only to fail to locate your query. Such was the case this Sunday for Noah and I. 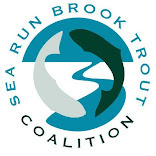 We wanted to intercept the Northeast's second herring run. Every late fall and early winter Atlantic herring make grace us with their presence, starting up north and progressing south as waters cool. 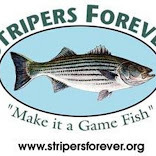 They often bring the last big striper bite out front before making themselves targets for shore bound anglers looking to extend their saltwater fishing just a little longer. Unlike the spring river herring run, Clupea harengus do not enter our inshore and nearshore water to spawn, not in December. Atlantic herring spawn in the summer, and are not anadromous. The early winter herring run here has more to do with changing water temperatures and food availability. Hoping to intercept some big schools of these silvery, slim bodied fish, Noah and I jumped in the van and drove into the urban jungle. There are parts of this state that I have not thoroughly explored. And when that is the case it is a smart idea to enlist the assistance of someone local. Lucky for us, Noah and I were stepping onto the turf of my good friend John Huber. Before we went off on or herring mission, he gave us the tour of some of his trout, striper, and bluefish spots. We saw and fished some good water although the conditions were not ideal. And I found some sweet old glass coke bottles and some quartz crystals, so it isn't just the fish that will draw me back to these spots. After we parted ways with John, we fished or tried to fish a number of known herring spots. Nobody seemed to be out there targeting them, which was problematic. Typically if they are around there are folks out there in the cold loading up sabiki rigs with fish to take home. We saw signs of life, we were there for what should have been the right tide, fishing the right stuff, but we did not get so much as a bump. There is more to be learned here. I wanted to salvage the skunk, I've had a few this week trying to find safe ice (there was none). A wild trout stream on the way home gave up the goods. A pretty fish it was, but not what we did all that driving for. These are the realities of my pursuit. On any given day I could chose to go after something I've caught many times before, or a new species. If I got for what I've caught before I'm liable to have better success. I am also not as likely to learn as much. But when I've caught most (not all) of the species in close proximity to home, it becomes more costly and time consuming to go for something new. Is it worth it? Hell yes it is. Whether or not I will catch #101 before I go back to Florida remains to be seen, but I am going to try.